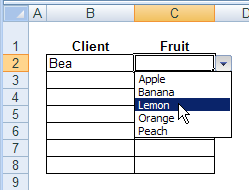 In this Excel data validation example, you'll create an Excel Data Validation drop down list that allows one specific user to add new items. The new data validation items will be automatically added to the drop down list, and the list will be sorted alphabetically. This technique isn't foolproof, and anyone who's determined to circumvent it would be able to. But, it's a good way to remind people that they can't update the list without permission. For instructions on setting up the worksheets and List sheet sort code, see the Excel Data Validation - Add New Items page. Follow those instructions, up to the Data Entry Code section. Then return to this page for the Data Entry Code. The Data Entry code shown here will allow only one specific user to add new items. All other users will see a message that says they're not allowed to add items. On the worksheet code module for the DataEntry sheet, you'll add code that runs automatically if a change is made on the worksheet. Right-click the DataEntry sheet tab, and click View Code. The Visual Basic Editor (VBE) window opens, and the empty code module for the DataEntry sheet is shown. At the top left of the code window, click the arrow in the Object drop down, and click on Worksheet. A couple of lines of code will be automatically added to the code module, and you can ignore that code, or delete it. At the top right of the code window, click the arrow in the Procedure drop down, and click on Change. When the cursor is flashing, type or paste the following code, between the Private Sub Worksheet_Change and End Sub lines. Then, change the strAuth to the person you want to allow to add new items. & "Please check with Administrator." MsgBox "Could not add new item"
In the the Client column, type Ann, then press the Enter key. Click the drop down arrow in the Client column, and you'll see that Ann now appears in the drop down list. Check the Lists sheet, and you'll see that Ann was added to the ClientList range, between Al and Bea. In the the Client column, type Joe, then press the Enter key. 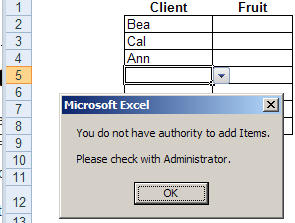 A warning message appears, and the invalid entry is removed from the data validation cell. The EnableEvents property is set to False, so any other changes to the worksheet will be ignored, while this code is running. In the exitHandler, the EnableEvents property is set to True, so changes to the worksheet be detected again, when this procedure stops running. Download the free workbook with the macro. Excel Data Validation Add Items-User This zipped file contains macros, so be sure to enable them when opening the workbook.